Parmigiano Reggiano DOP Aged 36 Months (200g) - Artisanally produced at 1000m in the Appenine Mountains, this wonderful, aged Parmesan is made from raw cow’s milk as all DOP Parmesan should be. Gorgonzola Piccante DOP Gran Riserva (200g) - Sharper and firmer than the 'dolce' version of Gorgonzola, this cheese is straw coloured with more blue veins. Creamier than Stilton, but just as strong, the Gorgonzola Piccante is aromatic and intense and has been matured for 120 days.Sardinian Carasau Flat Bread (250g) - This wafer thin flat bread is a Sardinian speciality! It is light and crispy and goes perfectly with cheese and antipasti. This delicious selection of cheese, wine and sauces is presented in our large silver box (the cheeses are packed in a chilled box first) which is tied with a colourful ribbon. A gift message option is available at the checkout. If we are out of stock of any item we reserve the right to substitute it with the most similar available item. Wooden cheese board, knife and glasses not included. 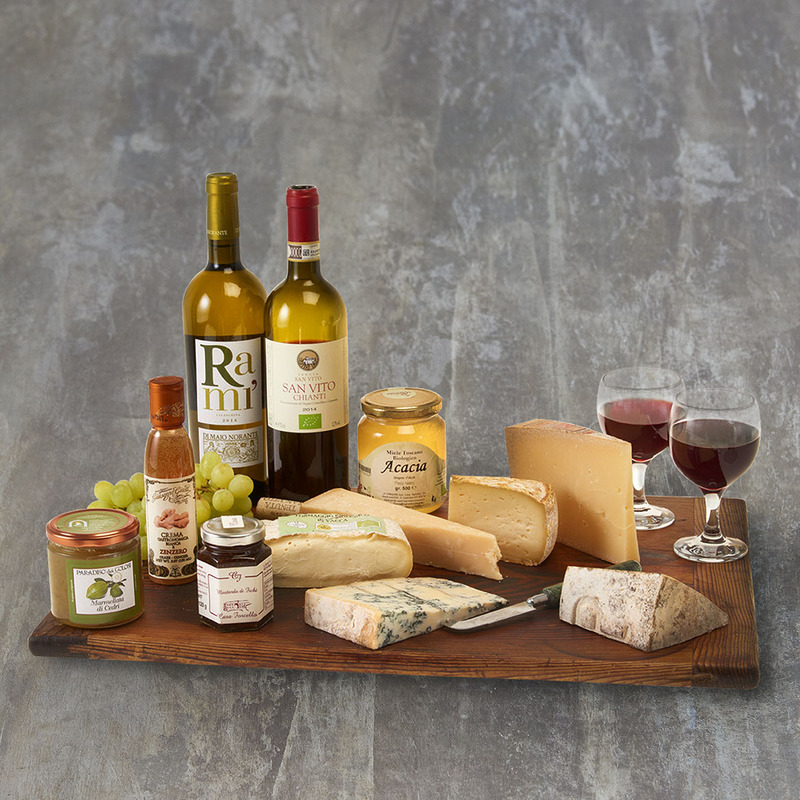 Minimum quantity for "Cheese and Wine Party Hamper" is 1.